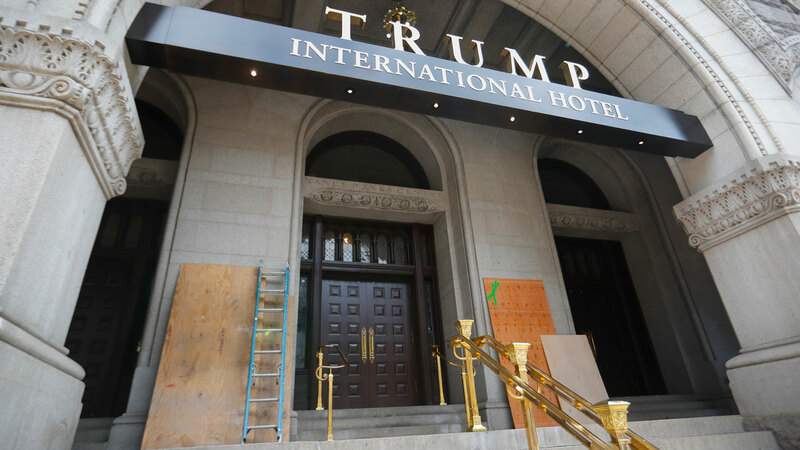 WASHINGTON, DC -- Donald Trump's new luxury hotel in downtown Washington has been vandalized. District of Columbia police say someone spray-painted the phrases "black lives matter" and "no justice no peace" on the front of the building on Saturday afternoon. On Sunday, the phrases were covered up with pieces of plywood. Police spokeswoman Aquita Brown said Sunday that police have not identified any suspects. The incident occurred just after 4 p.m. Saturday, and police are investigating. The Trump International Hotel opened on Sept. 12. The Trump Organization won a 60-year lease from the federal government to transform the historic Old Post Office building on Pennsylvania Avenue into a hotel. Rooms at the hotel start at just under $400 a night. A publicist for the hotel declined to comment on Sunday.